Another Friday and another day of “working from home” which actually entailed going back to the Indonesian embassy to pick up my passport and business visa. As I had just got back from Istanbul the day before my fridge was empty and there was no sense restocking it as I my next trip will see me out of the country for 3 weeks. I could wallow but I actually saw this as the perfect opportunity to have lunch out in Paris after all when opportunity knocks it is best to open the door! Given that today is a working day I needed to find somewhere that served food quickly but that was relatively healthy and hot. Despite the continued good weather, I was not in the mood for salad. Japanese food I thought, always fast and relatively healthy if I stayed away from the soya sauce – tricky! 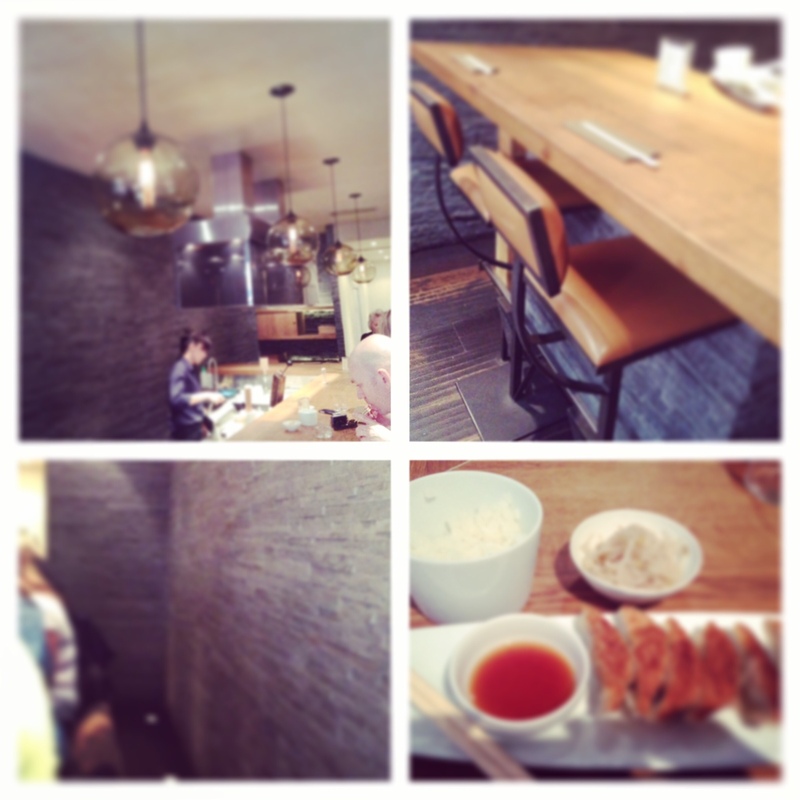 I had walked past the Gyoza bar or should I say the queue outside the Gyoza bar when I went to eat at Noglu. I couldn’t really see much but the number of people waiting outside had peaked my curiosity and so I added this place to my list of places to try in 2014. It is located in the covered arcade which is rammed full of restaurants lots of them tourist trap style places and then a few hidden gems this being one of them. There is no outside seating and the entrance is discreet so if you are walking and talking just look for the number 56 or you will miss it! There is one other thing I should point out about the Gyoza bar – there is only one type of gyoza – Japanese fried parcel of delight – pork. If you don’t eat pork then stop reading and don’t bother hunting out this hidden gem – there is nothing for you here! A sleek bar awaits you as you enter this long galley like space and slate covered walls and transparent lampshades. I didn’t have a booking and not sure this place takes bookings anyway, as it is not a space to sit and linger. Upstairs there are 12 places at the bar and then there is a downstairs room as well. This is the ideal location for a quick lunch, the menu has two choices and it is based solely on how hungry you are: 8 or 12 pieces of gyoza. That is it, quick and painless wasn’t it. Oh well, there is the question of whether you want to fill it out a bit and add a little bowl of rice but that truly is it. The pork that fills these Japanese parcels of joy is from none other than Monsieur Hugo Desnoyer – the rock star of Parisian butchers with his own cookbook, website and butcher’s shop not far from me in the 14th arrondissement. The name Desnoyer in the meat world well is a stamp of quality as is a dyson to the vaccum world. Monsieur Desnoyer’s meat isn’t just any old meat – even Alain Ducasse raves about him and he supplies meat to all the top restaurants of Paris. Therefore, Gyoza bar may be serving only one type of gyoza but with the best meat money can buy! 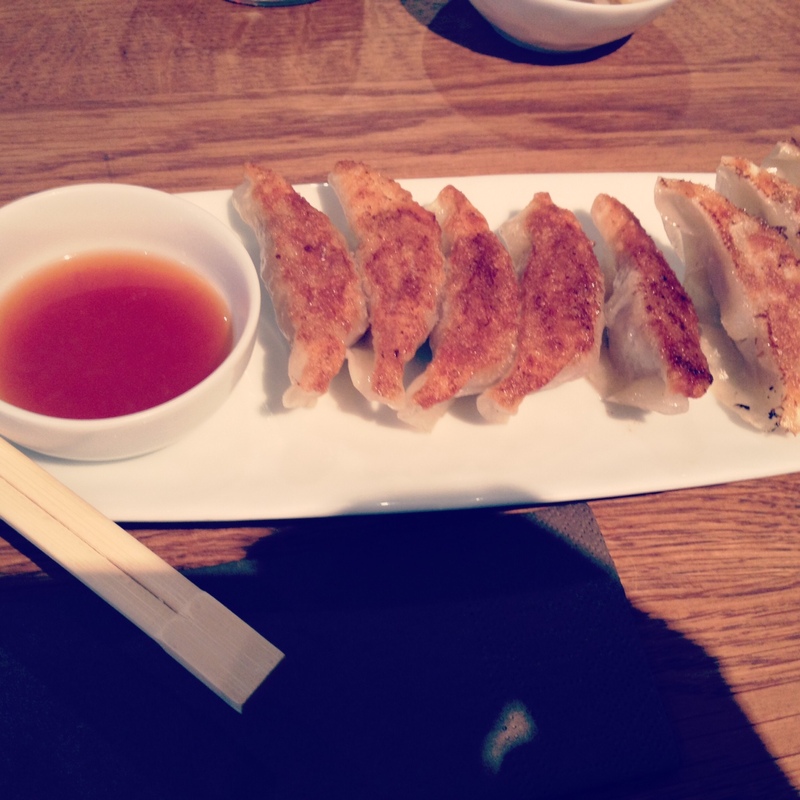 The gyoza’s were delicious – crunchy, with a slight chew and the pork lightly seasoned. I ordered a small bowl of rice and well I just couldn’t stay away from the soya sauce – oops. There is no dessert or coffee, this is a proper Japanese gyoza bar where you eat and then, well, you run! 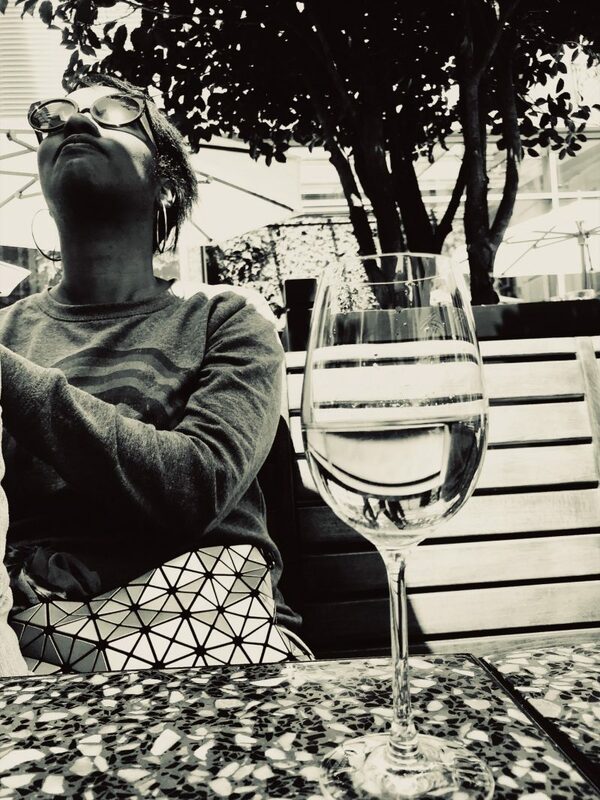 As quick lunches go – this was great and it’s a great place to stop into for a solo lunch. 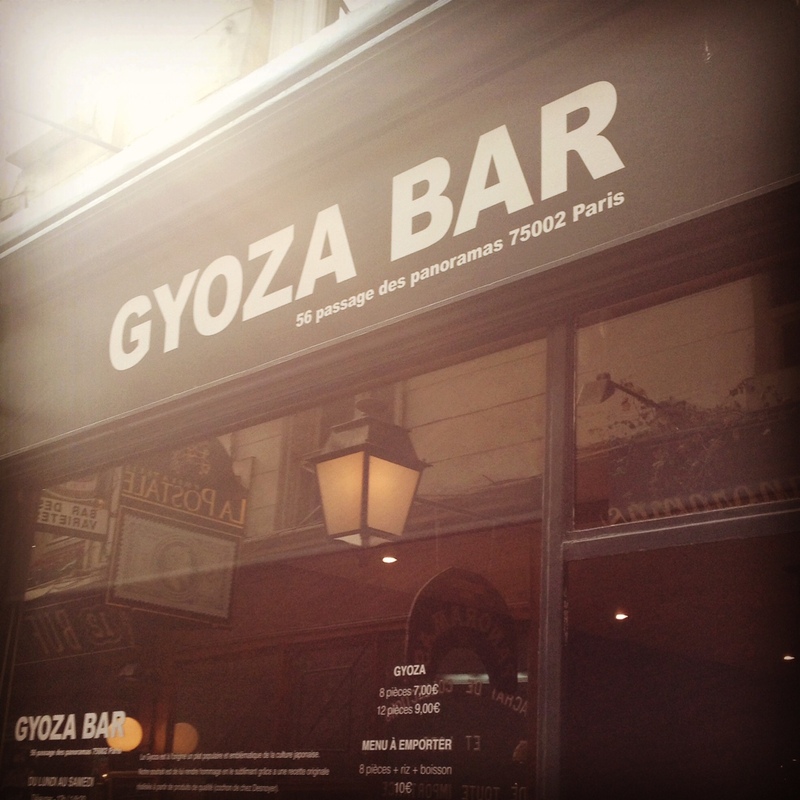 The take out menu is even better – gyoza, rice and a drink for €10 – bargain!